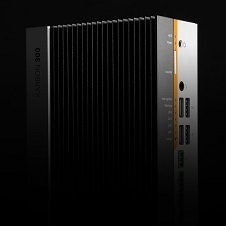 SOUTH BURLINGTON, VT - MARCH 26, 2019 - Global industrial and IoT hardware manufacturer Logic Supply (www.logicsupply.com) has combined the latest vision processing, security protocols, wireless communication technologies, and proven cloud architectures to create the Karbon 300 rugged fanless computer. The system has been engineered to help innovators overcome the limitations of deploying reliable computer hardware in challenging environments. "Computing at the edge is increasingly at the core of today's Industry 4.0 and IIoT solutions," says Logic Supply VP of Products Murat Erdogan. "These devices are being deployed in environments that would quickly destroy traditional computer hardware. The builders and creators we work with require a careful combination of connectivity, processing and environmental protections. With Karbon 300, we're providing the ideal mix of capabilities to help make the next generation of industry-shaping innovation a reality, and enable innovators to truly challenge what's possible."